The MultispeQ relative chlorophyll correlates well to the industry standard Minolta SPAD 502+ (Minolta = MultispeQ * 1 – .93, r2 = .987, using 11 devices and 68 measurements). Validation was performed on Ficus, Basil, Banana Tree of varying thickness (.07 – .62mm) and greenness levels (Minolta SPAD values from 24.5 – 60.8). Very thick (aloe) or very small leaves may require adjustments to measure consistently, but the measurement range is similar to the Minolta SPAD 502+. The MultispeQ leaf thickness is an accurate (thickness = multispeqThickness * 99 + .01, across 11 devices and 209 measurements), inexpensive, and simple field based leaf thickness measurement. 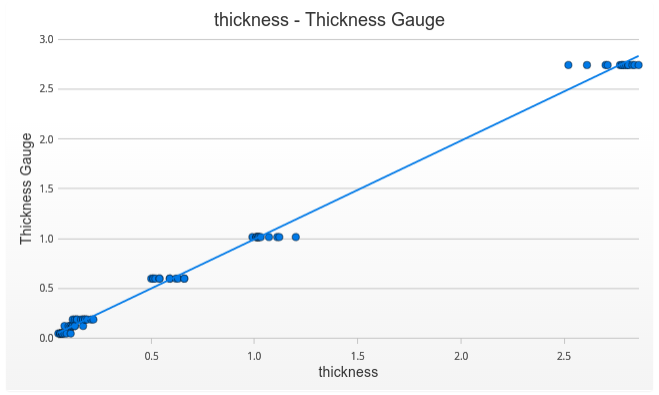 Strong magnets or large pieces of metal close to the device can impact thickness calibration. Leaf veins should be avoided when clamping if a very accurate leaf thickness measurement is desired. The MultispeQ ambient PAR correlates well to a LiCOR LI-250A PAR meter (LiCOR = MultispeQ * 0.95 + 3.99, r2 = .996, using 13 devices with 206 measurements). Devices showed some offsets from the actual PAR, but the noise at any given light level for each device is relatively low (high r2). Validation included measurements in different spectral conditions: cloudy day, sunny day, LED, and fluorescent lights. Additional spectral conditions (for example, inside a dense canopy) should be added to improve the quality of the validation. The MultispeQ has to replicate ambient PAR inside the measurement chamber. This is quite tricky because there is some error in measuring ambient PAR and some error in converting ambient PAR to a defined LED intensity. Those two errors combine to increase total error. The MultispeQ’s conversion of ambient PAR to LED light inside the leaf chamber is ActualPAR = 0.94*LEDPAR + 12.17 (r2 0.979) using 10 devices, across a range of spectral conditions and intensities, with a total of 253 measurements). MultispeQ LED PAR tended to be shifted higher slightly compared to the actual ambient PAR. 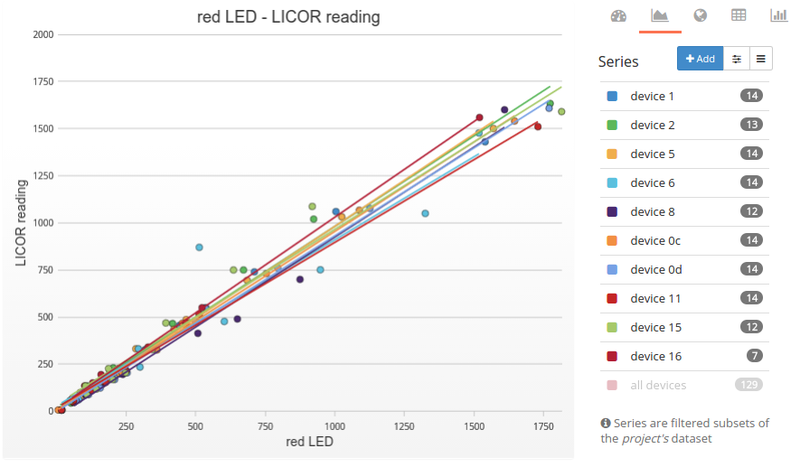 Green, red, and blue LEDs (lights 1,2, and 4) correlated the best with the LiCOR LI-250A. The orange LED (light 3) performed the worst. We’re going to continue to validate and check devices as we produce them, and post it through these same projects so everyone can see it. Expect another update regarding production status in the next few days.